Can you add those actions to your demo to see if they work for you? I see you’ve changed the styling with the new version. Not sure which one I like better, but they’re both okay. But there is a new issue. The last version did an excellent job of making sure the whole step was always on the screen. With the new version, the step goes off the screen. Hello, thanks for reporting it. We’ll look into it and offer an update on the matter. Hello @philnauta, thank you for reaching out. We just made Plugin Update with some minor fixes. All your comments are fixed now. In addition to the issues above, there’s another small issue. 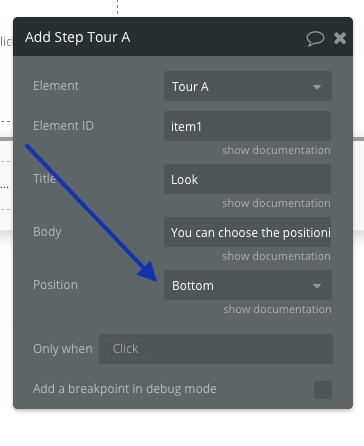 Although the Tour element obviously is never visible on the front end, it still impacts the responsiveness of the site, causing other elements to move to the line below. I know for other plugins with invisible elements like this, that doesn’t happen. Can you check it once please ? Can you send us an example (screenshot or link) ? Responsiveness. 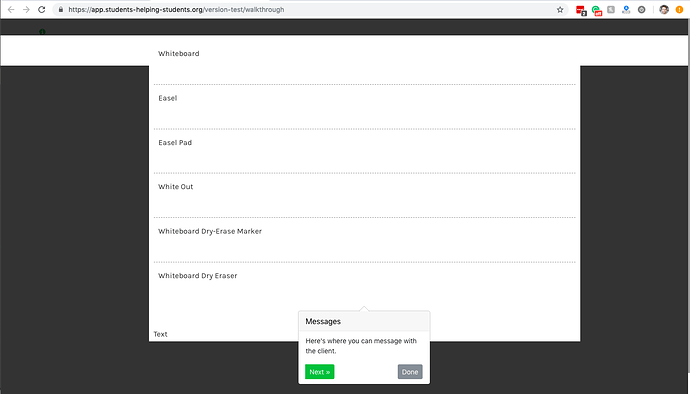 If you view this page ( https://app.students-helping-students.org/version-test/walkthough ) on desktop, you’ll see that the green icon is centered. If you view it on mobile, you’ll see it’s over on the right side of the screen. That’s because the Tour element is on the same line and is impacting the responsiveness of the icon. I’ve solved this (on my other pages) by putting the Tour element directly behind the icon, so it’s no longer a big deal, but thought I’d mention it anyway. Previous button. 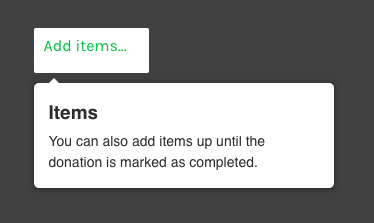 If you click the green icon on the above page, even though there’s only one step, there’s a ‘Previous’ button. Should probably be hidden when there’s only 1 step. Colors. If you’re going to use color (your ‘Next’ button is green), you should allow me to set the color myself so it matches my colors. I think we need an ‘End Tour’ action because sometimes, as a user is going through the steps or highlights, they may end up clicking an element, which shows/hides certain groups on the page, and then they can’t close the tour. I’ve created a quick example below. It’s not a great example, but this is an issue I’ve run into a couple of times now. -Go to https://app.students-helping-students.org/version-test/walkthrough2 and click the green icon to start the tour. -Click ‘Next’ to go to the 2nd step of the tour. -Click the green ‘Group 2’ button. -Click ‘Previous’ to go back to the 1st step of the tour. If I had an ‘End Tour’ action, I could run it when the green ‘Group 2’ button is clicked. We made plugin update with this 3 fixes. Hope it will help a lot and thank you for issues updates. We trying to make our plugins better. Next issue: One thing I absolutely love about this plugin is that it only shows the steps where the corresponding elements are visible. So if I have 5 ‘Add Step’ actions but only 2 of the elements are currently visible, the tour will have only 2 steps (it will skip the invisible elements). That’s amazing because then the tour can automatically change depending on which items are visible. If the 1st step’s element is invisible, there will be a Previous button pointing back to it, but when you click that button you’ll be stuck at the invisible element. If the last step’s element is invisible, there will be a Next button pointing to it, but when you click that button you’ll be stuck at the invisible element. I think this also happens with steps in the middle of a tour, but it doesn’t matter because when you click Next, as long as there is a step after it, it will go to that step, and when you click Previous, as long as there is a step before it, it will go to that step. So it only causes a problem when the 1st or last step’s element is invisible. 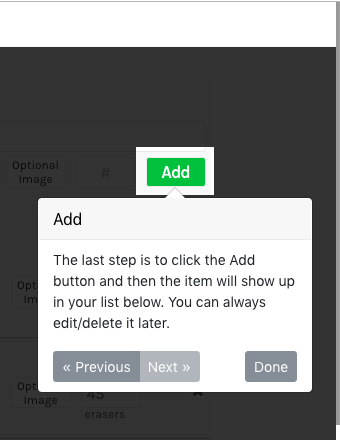 Long story short, I think you need some logic on the Previous button that so it only displays when there is there a previous step’s element that is visible and next button logic that only displays when there is a next step’s element that is visible. Make sense? You’ll notice in the first image that there’s a horizontal white stripe going across the whole width of the page near the top, and also, the highlighting goes too far down at the bottom, into the next text area. we couldn’t reproduce the issue. What device/browser are you using? What’s the screen size? Macbook Air, Chrome Version 71.0.3578.98, 1440x900 screen size. I added you as a collaborator. Thanks! we still couldn’t reproduce it. 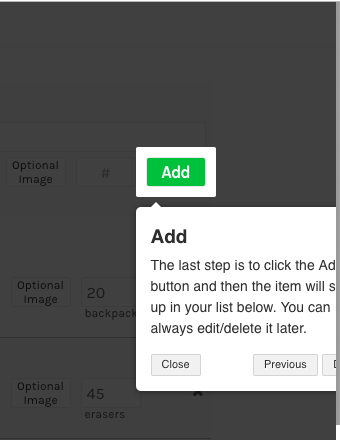 one idea is that it might be due to using a reusable element, can you try putting in a normal group on the page and retry?